← Eat, Fast and Live Longer. A 5-2 Fast Day Recipe Idea Under 200 Calories. Donna Hay’s Asparagus “Risotto” With Snow Peas, Mozzarella and Basil. We’ve always had a weakness for pizza at our house. In all its many guises… wood fired oven baked, barbecued on terracotta pavers, fried on the stove top pizzette style. Last year we acquired a shiny red electric bench-top pizza oven, and promptly fell in love with speedy, thin crust pizza rendered perfectly crisp in 10 minutes flat. This spring we’ve done a complete about turn. Our new favourite? Old style deep dish pizzas with golden focaccia crusts sturdy enough to hold a mountain of delicious sugo infused toppings. They’re delicious hot or cold and are easily prepared in advance. One deep dish pizza easily feeds four hungry people. Two means that there are plenty of leftovers for lunches next day. I’ve made deep dish pizza countless times over the last month or so. I love how effortlessly it comes together once the pizza dough has been kneaded and set aside to prove. So much so that I have taken to doubling the recipe and storing big batches of dough in the freezer. I figure I’m investing in economies of scale time wise; it really doesn’t take much longer to knead a bigger batch of dough and proving time is exactly the same. Ditto the tomato sauce or sugo. Today’s offering is a garlic prawn and mozzarella cheese rendition, but feel free to substitute whatever toppings take your fancy. Sometimes I just add roasted vegetables, other times cured meats or crumbled Italian sausage. As always there are no hard and fast rules, the only limitations being the contents of your fridge and pantry, or perhaps your imagination. Buon appetito. Start with the pizza dough. You will need to start making the dough at least 2 hours before you need it. You can make it the day before or even earlier if you like. Dough can be stored in the refrigerator for a day or two and is also suitable to freeze. IN A SEPARATE bowl combine the yeast, sugar, olive oil and lukewarm water. Leave to stand for a few minutes to activate the yeast. When the yeast is activated the mixture will begin to froth. A useful rule of thumb for tepid water is one part freshly boiled water to two parts cold. ADD wet ingredients to dry and mix to a soft dough. DUST a work bench with semolina flour. Turn the dough out onto the bench and knead for 5-10 minutes or until the dough is smooth and springy. Use the heel of your hand to push and stretch the dough. Lift and fold it towards you, making a quarter turn. Continue kneading, turning the dough a quarter turn each time, for 10 minutes or until the dough is smooth. PLACE the ball of dough into a clean oiled bowl and cover with a tea towel. Leave it in a warm place to rest and relax for about an hour or until it has nearly doubled in size. WHEN the dough has risen, punch the dough with your hands to knock the air out of the dough. Lightly knead for a minute or two on a bench top that has been freshly dusted with semolina flour. DIVIDE the dough in half into two large balls. Give each ball of dough a quick knead and leave to rest for about 15 minutes before stretching. WHILE PIZZA DOUGH IS PROVING, heat olive oil in a heavy based saucepan over medium heat. Add onion and garlic and a generous pinch of salt. Cook for 3-5 minutes until onion is soft and translucent. ADD tomatoes. Reduce heat to low and simmer gently for 15 – 20 minutes until tomato mixture has thickened and is reduced by half. SAUCE may be prepared in advance and stored in the refrigerator in an airtight container, and is also suitable to freeze. IN A LARGE BOWL, combine prawns, garlic, chilli, parsley and olive oil. Season with a generous pinch of sea salt and a good grinding of pepper. SET ASIDE in the refrigerator to marinate for at least an hour. Prawns may be marinated in advance – overnight works well. PREHEAT oven to 250 C. Line two 30cm x 25cm x 6cm deep tins with baking paper. ROLL or stretch out dough to fit the tins. LAYER each pizza with half of the tomato sauce, garlic prawns and mozzarella slices. BAKE in hot oven for 20 – 25 minutes until crust is golden. If pizzas appear to be browning too quickly cover with a sheet of foil after 15 minutes. Remove from oven and allow to cool for 10 minutes or so before slicing. 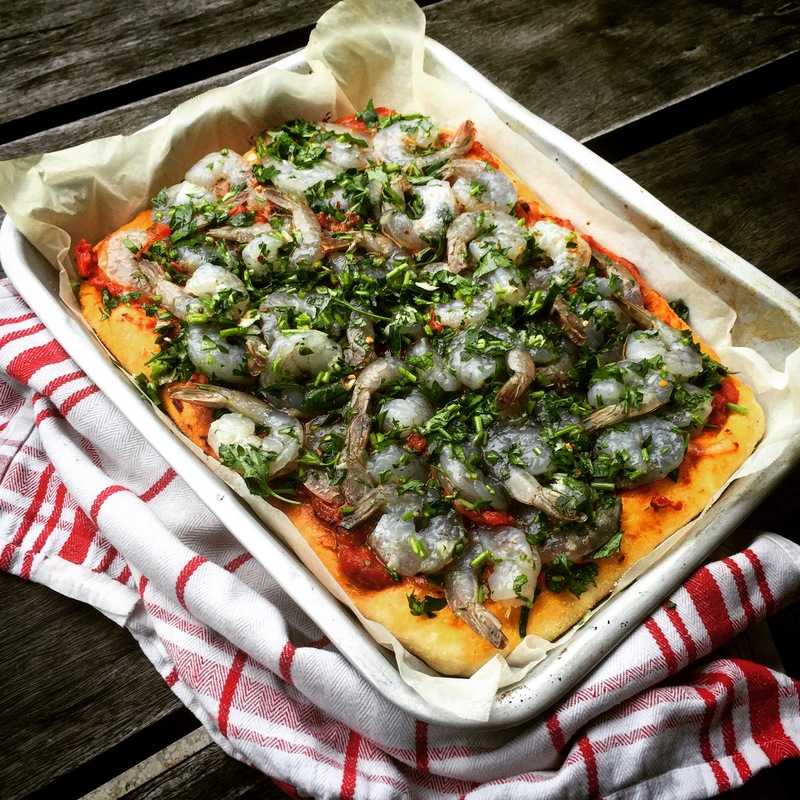 This entry was posted in Pizza and tagged Garlic Prawns, Italian, Made From Scratch, Mozzarella, Spring, Sugo, Tomato. Bookmark the permalink. Just wondering at what stage you can freeze the dough? After the first rise. Just separate into 2 balls, wrap tightly and freeze. Wow – I find using fresh yeast works a treat too with the Tipo 00 flour – that’s if you can get your hands on some! I just want to say I love your posts and have learned so much! Thank you for doing it!